Brakes returned from the long trip to south Wales with a well earned point from an entertaining contest against a Merthyr Town side who on this evidence look to be a good bet to remain up with the pacesetters in the division, writes Paul Edwards. Paul Holleran was forced to make a change to his starting 11 when Ryan Rowe picked up a slight groin strain during the warm-up. 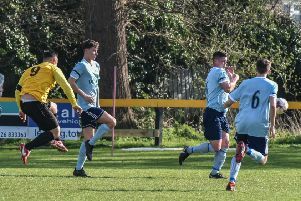 He was replaced by Callum Gittings, with Courtney Baker-Richardson moving into the central striker’s position and it was testimony to the strength in depth of the squad that they were able to go toe to toe with one of the stronger sides in the league without their 15-goal top scorer. The home side were quickest out of the traps and took an early lead through Ryan Prosser, who slotted the ball home low off the inside of the post from Ian Traylor’s right-wing cross with just five minutes played. Merthyr were clearly up for the challenge and zipped the ball confidently around their artificial surface as Leamington took time to settle, but they dragged themselves level with their first effort on goal in the 19th minute. Connor Gudger refused to give up on a chase for the ball down the left wing and dug out a superb cross from the touchline which was met by an unmarked Darren Pond at the far post, the midfielder keeping his eye on the ball and diving to head home his second goal of the season. Brakes started to come much more into the game as the confidence from the leveller seeped through the team, and they more than matched the hosts for endeavour and commitment as the game continued to ebb and flow. Jack Edwards nodded the ball towards goal for Baker-Richardson to chase, only for Curtis McDonald to shepherd it back to keeper Glyn Garner. A slick break from a Merthyr attack saw Thompson-Brown and Ahmed Obeng set up Baker-Richardson to place a shot straight at Garner. The closest Merthyr came to threatening Tony Breeden’s goal again was when a Leamington defensive header flashed past the post, but the home were still well in the game as half-time arrived. Prior to this Pond had a shot blocked, with Baker-Richardson firing the rebound well wide. Leamington were on top in the early stages of the second half without threatening the Merthyr goal but the Martyrs steadily began to regain the upper hand as the game wore on. Prosser’s shot was deflected into the side netting, while Kayne McLaggon’s shot through a crowd travelled safely through to Breeden. Obeng tapped into an empty net after Garner claiming a through pass and then dropped the ball, but the attacker was harshly adjudged to have committed an offence. It appeared Merthyr were a matter of inches from threading the perfect pass through for their front men, but while Leamington were doing a lot of defending on the edge of their own box they continued to hold firm. Tom James replaced Thompson-Brown who had taken a knock in the closing stages, and almost fizzed the perfect diagonal ball into the path of Obeng, who was charging into the penalty area. Both sides picked up late bookings which may hamper them further down the line but neither side deserved to lose an absorbing contest and while Brakes’ six-match winning run has come to an end they will take comfort from avoiding defeat against one of their promotion rivals. Merthyr Town: Glyn Garner, Scott Tannock, Scott Barrow, Jarrad Wright, Curtis McDonald, Rhys Baggridge, Ryan Prosser (Corey Jenkins, 83), Eliot Richards, Kayne McLaggon, Keyon Reffell, Ian Traylor. Subs not used: Ben Watkins, Oliver Davies, Gavin Williams, Gethin Jones. Brakes: Tony Breeden, Richard Taundry, Connor Gudger, Darren Pond, Jamie Hood, James Mace, Courtney Baker-Richardson, Jack Edwards, Callum Gittings, Rob Thompson-Brown (Tom James, 76), Ahmed Obeng. Subs not used: Ryan Rowe, Joe Magunda, Ben George, Nathan Olukanmi.